A lot can happen at the office while you’re away at a conference, on-site with a client, stuck in meetings, or best of all — taking a vacation. Here at ThoughtFarmer, we’ve sometimes imagined a giant pause button that could freeze all work while you’re away. While we haven’t quite been able to code that yet, we’ve come up with the next best thing: automated email newsletters. Our new email newsletters help employees catch up on items they may have missed with personalized daily and weekly news. Your internal communications teams will love them — they’re automated, they’re easy to set up and configure, and they help drive intranet engagement and adoption. Busy day? 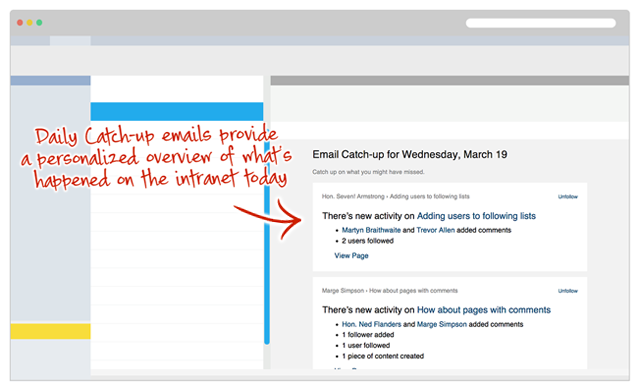 Our automated Daily Catch-up newsletters keep everyone on the same page. Quickly scan the email at the end of the day, or the start of the next day, to keep track of changes that have happened on your intranet. 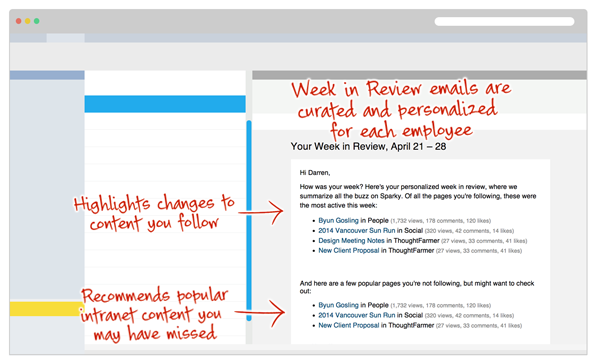 Emails are personalized for each employee based on content they follow. Whether employees are in the office or away on vacation, the weekly email newsletters capture every important change on your intranet. 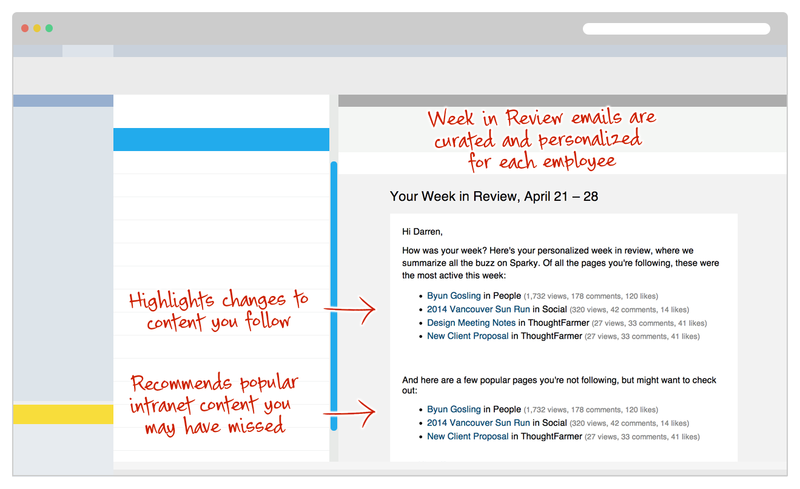 Employees receive a summary of changes to content they follow as well as a personalized list of the most popular pages on your intranet. ThoughtFarmer takes note of which pages each user visits, so users do not receive notifications about changes they’ve already seen. Plus our newsletters use your intranet security settings, so employees are only notified about content they have access to. Increase the open rates on your newsletters by adjusting the send time to suit your business. For example, here at ThoughtFarmer we send the Daily Catch-up emails at 4pm, so employees can take action on any items they may have missed throughout the day. For the weekly newsletter, admins can also decide the day of the week it should be sent. 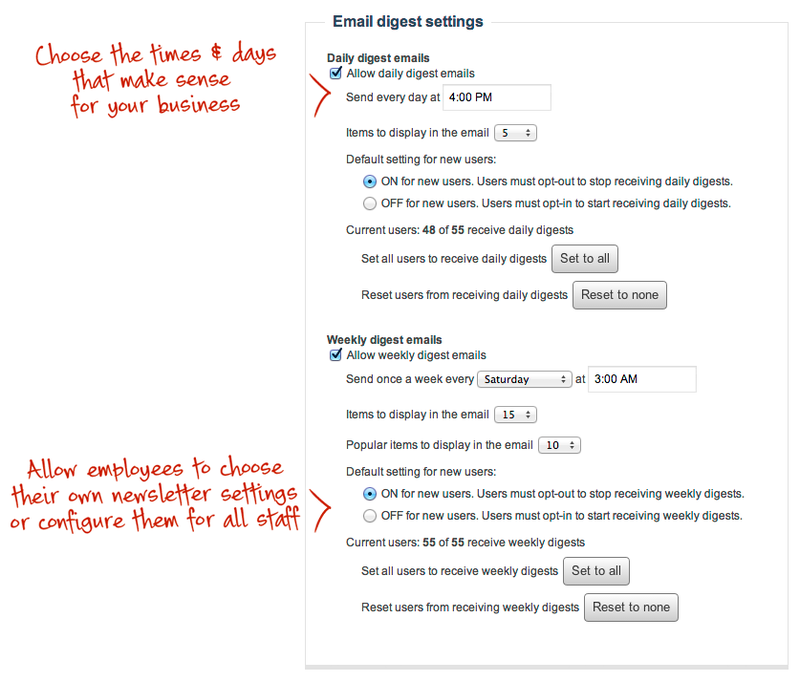 Admins can also allow employees to choose their own newsletter preferences or turn them on or off by default. ThoughtFarmer 7.0 Matcha is all about helping employees focus on what’s important inside your organization. 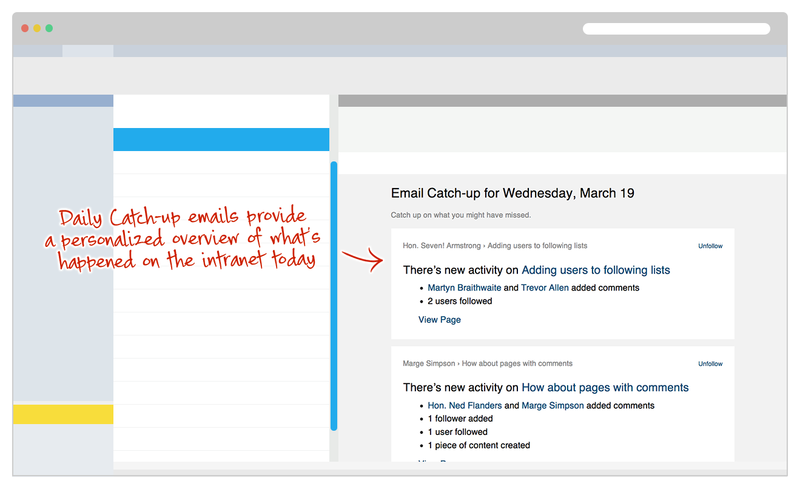 Automated intranet newsletters are a powerful way to ensure important content doesn’t get missed.